The gentle sway of a Flexible Leather Coral has an almost hypnotic movement in the correct water flow! Mesmerizing to watch, the Flexible Leather Coral Sinularia flexibilis is a bit more flexible than others in its genus. A more distinctive difference however, is that it is slimy to touch rather than having the dry, leathery feel most of the leather corals are known for. Like other Sinularia sp., the Spaghetti Finger Leather Coral is not as sensitive to handling and is an easy coral to propagate. This contributes to their predominating numbers in the ocean and makes them ready availability for the reef aquarium. But water quality is important to them, making them a bit more challenging to care for than their siblings. The S. flexibilis grow on hard substrates such as rubble or dead corals. They form encrusting colonies with finger like projections that have retractable polyps. They can be found in colors ranging from brown, tan, white and gray, and at times may be a more colorful green. 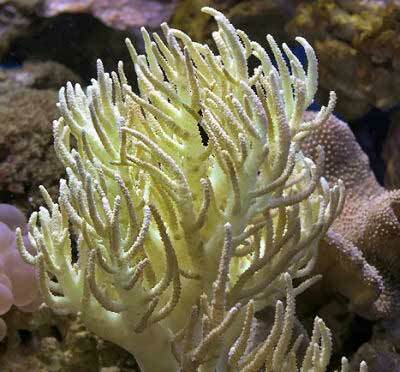 The Flexible Leather Coral can resemble some tree corals, but generally have a more antler-like growth pattern and a very prominent, heavy base. The Flexible Leather Coral is known by many common names including Rasta Leather, Spaghetti Finger Leather Coral, Flexible Leather Coral, Soft Finger Coral, or Thin Finger Coral. Because it is similar in form to other leathers, many of the same common names are used interchangeably such as Leather Coral, Finger Leather, Green Finger Coral, Finger Leather Coral, Scalloped Leather Coral, and Knobby Leather Coral. S. flexibilis are often mistakenly sold as a Finger Leather Coral or Colt Coral Alcyonium sp., but can be distinguished by their polyps which have a less feathery appearance. When ordering this or any other leather coral, its best to make sure you use the scientific name. The Flexible Leather Coral is moderate in care to keep since they do need clean and stable water conditions. They like a moderate to strong water flow and moderate to high lighting. They also don't do too well in a new tank, and should be added to an established tank for best results. They are easier to care for when added to a tank with these parameters. S. flexibilis are toxic toward other corals due to their release of terpenes (poisons used to ward off encroaching corals), so they do need plenty of space. The Flexible Leather Coral, Sinularia flexibilis, is different from the Finger Leather Coral in that the branches are longer, thinner and more erratic. The polyps are not as "fluffy" as the Finger Leather Coral and when you see them side by side it is obvious. While they can grow up to 10" (25 cm), they tend to reproduce and spread horizontally and can take up an entire aquarium, making for an interesting display! Grab yourself a green one, let it multiply and then frag, sell and cha-ching! Leather Coral Information: The Sinularia genus was described by May in 1898. They belong to the family Alcyoniidae, which are referred to as octocorals. There are around 138 species and subspecies of Sinularia (this number will grow over time). Some of their common names are Leather Coral, Finger Leather, Ruffled Leather Coral, Flexible Leather Coral, Finger Leather Coral, Knobby Leather Coral, Scalloped Leather Coral, Green Fiji, Sinularis Finger Leather, Rasta Leather Coral, Flexible Leather Coral, and Knobby Leather Coral. The Flexible Leather Coral S. flexibilis was described by May in 1898. It is also known as Rasta Leather, Spaghetti Finger Leather Coral, Flexible Leather Coral, Soft Finger Coral, or Thin Finger Coral.This leather has many names similar to other leathers such as Leather Coral, Finger Leather, Knobby Leather Coral, and Lobed Leather Coral. They have been propagated in captivity. Sometimes Sinularia corals are dyed because the areas some come from have been bleached due to pollution and weather patterns. Or they are dyed to get brighter colors, like fluorescent greens, but dyed corals tend to not do as well. Where Sinularia Corals Are Found: The S. flexibilis are found in the Indo-Pacific. Sinularia Coral Habitat: Most S. flexibilis are found near the shore in shallow water on reef flats and lagoons, attached to rubble. They can thrive in the turbid waters within large colonies, due to their thick bases. The Sinularia flexibilis is not listed on the IUCN Red List for Endangered Species. What do Sinularia Corals look like: The Flexible Leather Coral S. flexibilis form encrusting colonies with finger like projections that have retractable polyps, and it is a bit more flexible than others in its genus. They grow on hard substrates such as rubble or dead corals, They can resemble some tree corals, but generally have a more antler-like growth pattern and a very prominent, heavy base. They are also slimy to the touch rather than having the dry, leathery feel most of the leather corals are known for. Yet they are not as sensitive to handling as other soft corals, especially when propagation is done. The S. flexibilis can be brown, tan, white and gray, and at times may be a more colorful green. They are not naturally fluorescent, since that is a dyed coral. They can grow up to 10" (25 cm). Leather Coral Care: The Flexible Leather Coral S. flexibilis is moderate in care to keep since they do need clean and stable water conditions. They like a moderate to strong water flow and moderate to high lighting. They also don't do too well in a new tank, and should be added to an established tank for best results. They are easier to care for when added to a tank with these parameters. They are very toxic toward other corals due to their release of terpenes (poisons used to ward off encroaching corals), and they need plenty of space. They also regularly shed their top layers. Leather Coral Feeding: In the wild, Sinularia corals have developed several feeding strategies. They capture microscopic food particles from the water column and can absorb dissolved organic matter. They are also photosynthetic, having a symbiotic relationship with a marine algae known as zooxanthellae, where they also receive some of their nutrients. Stable tank conditions are needed to keep the Sinularia genus. A water change that is a standard for any reef system, not to exceed 30% is needed. In general, a typical water change of 20% a month or 10% biweekly, depending on the bio load, is sufficient. Some have found success by doing a 5% water change once a week, keeping water quality high and reducing the need for most additives. Soft corals do need to have proper chemical levels for good growth. A typical live rock/reef environment is what is needed for your Flexible Leather Coral, along with some fish for organic matter production and plenty of room to grow. Water Movement: Moderate to strong, with a random flow is suggested. The Flexible Leather Coral is very aggressive. The S. flexibilis is toxic toward other corals due to their release of terpenes (poisons to ward off encroaching corals). They have been known to harm some stony coral species of Acropora like the Staghorn Acropora A. formosa, some species of Porites like P andrewsii, as well as the death of Catalaphyllia, Euphyllia, and Plerogyra species. Specifically, the Sinularia polydactyla have females that remain erect and males retract and become flaccid during spawning. Other species are still being studied in this regard. The S. flexibilis, once mature, will drop clones of themselves. The Flexible Leather Coral is easy to propagate. In general, the Sinularia species can be fragged for just a small piece or for a large frag, but with a few variations in procedure. Using either procedure, the coral will more than likely deflate, but with good water flow it will recover. Corals can emit a nasty and at times noxious odor, so be sure there is good ventilation. Clean up any mucous when finished to prevent any possible health problems. The Sinularia genus is generally hardy and adaptable, but can contract disease. Coral diseases are commonly caused by stress, shock (like pouring freshwater into the tank and it coming in contact with the leather), and incompatible tank mates including specific fish, or pests. Soft Corals for Sale: The Flexible Leather Coral S. flexibilis is very easy to find pet shops and on line. Online they can run about $50.00 to $90.00 USD, or more, depending on size and/or color.